Home > Lighting > Chandeliers > COMING SOON! Chandelier "Queen Fiona" K9 Crystal & Chrome - 2 Tiers - 33" x 52" - 12 Lights! COMING SOON! Chandelier "Queen Fiona" K9 Crystal & Chrome - 2 Tiers - 33" x 52" - 12 Lights! Chandelier "Princess Alice" K9 Crystal & Chrome 21" x 26" - 5 Lights! 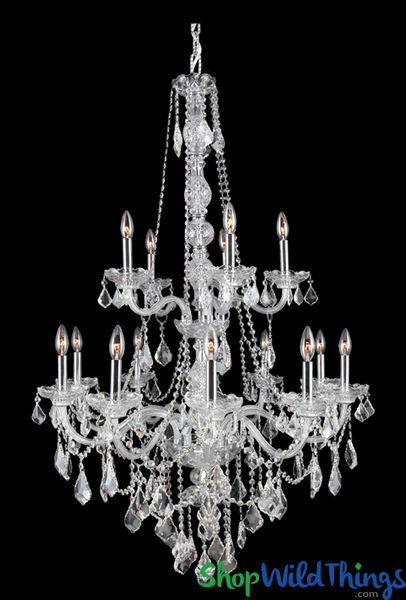 Chandelier "Princess Beatrice" K9 Crystal & Chrome 27" x 34" - 8 Lights! 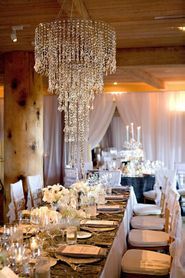 This Real Crystal Chandelier has 12 lights and is perfect for your fanciest of Weddings, Special Events and Galas! This Chandelier matches our 1 Tier, 5 Light Version called "Princess Alice" and our 1 Tier, 8 Light Version called "Princess Beatrice". The video shown is not of this chandelier, but it is of the exact beads that we used, showing you the quality that you can expect from this chandelier. It's absolutely beautiful - and made in the same factory as this chandelier. You will not believe your eyes when you unpack this box. Everyone in the ShopWildThings offices is MOST proud of this collection that took 4 years for us to perfect. Get White Glove Service and 54" of cascading K9 Real Crystal Strands with our "Queen Fiona" Crystal Beaded Chandelier with Chrome accents! She"s absolutely spectacular from top to bottom! The chandelier body is 52" long by 33" wide and it comes with 44" of heavy duty hanging chain with a silvery white wire, a ceiling cap with crossbar and assembly instructions. This Chandelier has 2 tiers and the entire body, arms, cups and decorative caps are crystal clear cut glass. The top tier has 4 arms and the bottom tier has 8. The wires run through the arms and body so they are completely concealed. Each cup surrounds an E12 candelabra socket that's covered with a chrome sleeve. This chandelier needs 12, E12 candelabra bulbs, 60W max (bulbs not included). The entire body is cut glass and the angular design of the cuts make this chandelier palace worthy! Ornate and luxurious - bringing opulence to any Decor style! This is a hard-wired chandelier and all hardware required for installation is included. You will even receive a pair of White Gloves! it's obvious that scrupulous attention and meticulous care was taken when crafting our exquisite "Queen Fiona" Chandelier! K9 Crystals are top-grade quality and they throw prisms and rainbows with the slightest bit of light. 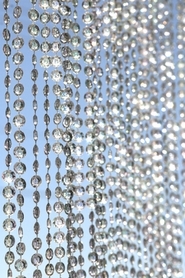 Since all of the beads are faceted, this chandelier has optimal shine and is stunningly beautiful from any angle. A total of 121 strands cascade from top to bottom; from all the cups, arms, in between the arms and even between the tiers! 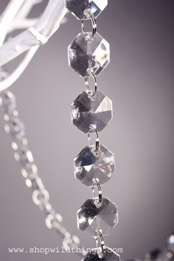 Most strands are finished off with either a 2" or 3" long faceted pendant and the crystal strand at the very bottom of the chandelier has a 1.5" in diameter faceted crystal ball. There is 54 feet of crystal strands and pendants! it's absolutely amazing! The strands are strung together with decorative metal attachments and each needs to be hooked into place using the flexible metal tabs on each end. There are no tools required to attach the strands - just a light pinch will do. This chandelier weighs approx. 38 lbs. Add classy light and panache to any room, hallway, entryway or add glitz and glamour to weddings and events with this extraordinary "Queen Fiona" masterpiece!